I sat thinking one day about starting a survival world in an uncommon biome so I could do something new. I thought about using an Ice Spikes biome, but then realized there is nothing useful in this biome. The only thing it has over other biomes is tons of Packed Ice and Snow, both of which are almost useless in a normal survival game. Thats why I thought of an Ice Temple! Many people before me have probably suggested similar ideas, but I went further as to designing the temple and thinking of clever ways to hide chests and the like. A large dome-like spike made out of packed ice in the center, surrounded by four smaller spikes that are connected to it. On the inside, there is a large Ice and Packed Ice sphere. The normal Ice makes a small 2 x 2 x 2 space inside, and whenever you remove the normal ice from the ceiling of this room, water flows down. 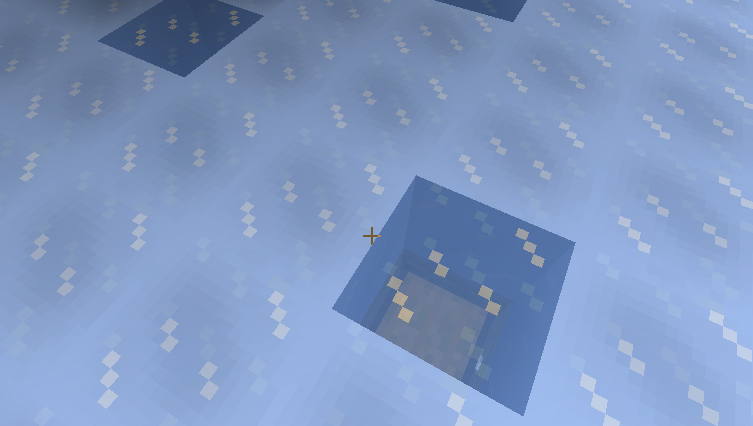 If you swim up the water, there is a room with normal ice as a floor with many holes in it. Each small spike contains a Lapis Lazuli Block. In the room at the top of the temple that you get to via water, there are 4 large trapped chests. 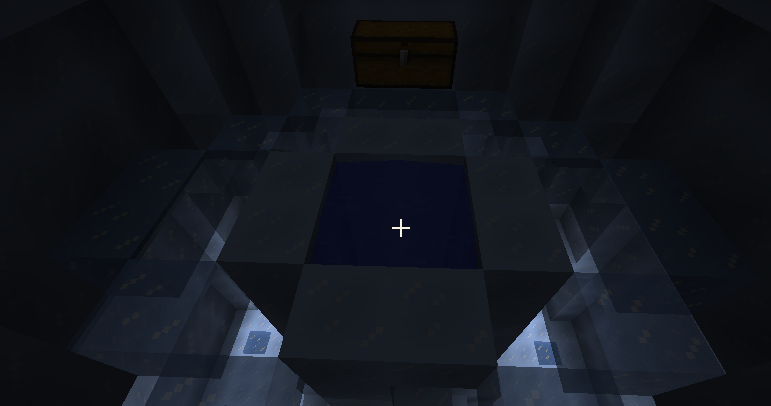 Underneath one of the floor ice blocks, there is a chest. 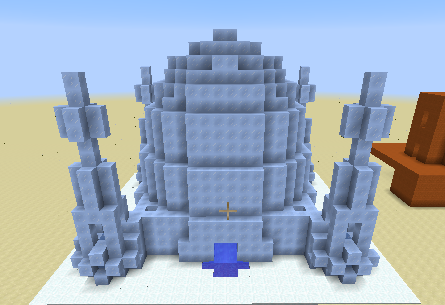 This Temple would be a source of Lapis, which is useful for enchanting, Melons, which could be a good food source if you are stuck in an Ice spikes biome, and many of the things from other temples. This temple would not be really game-changing because of the rarity of Ice-Spikes biomes, but at least the biome would be desirable to find. I attached pictures of an Ice temple I built. In the top room there are now four large trapped chests instead of one large chest. There is less loot in these large chests, but combined have about the same loot as the original idea for one chest. One has a comparator to tell if the chest is there or has no items and the other emits a signal which turns on 4 redstone lamps. 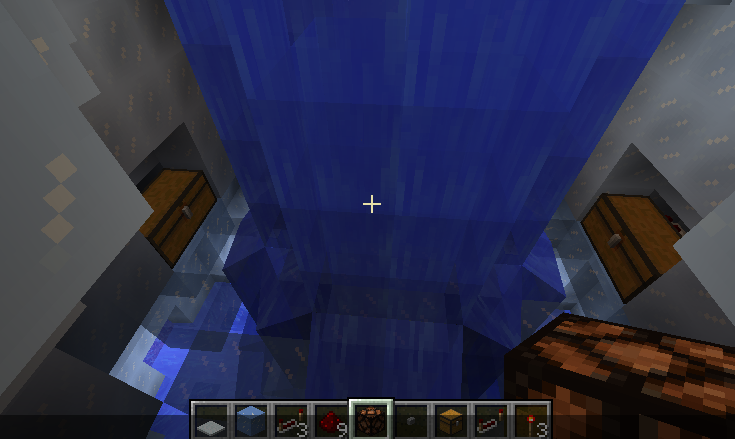 The lamps stay on permanently (Unless you break a circuit in the roof) and melt 8 blocks of ice, which all randomly melt and block update each other (to make the source block actually flow) and create a cascade of water that makes it really difficult to open the chests. The water also makes you vulnerable to skeletons, and if you're not careful you will drown. Super cool looking, and would definitely add to the exploration aspect! Support. That is actually a rather nice idea, this could be generated through Taiga or other snowy biomes and slightly more commonly in Packed Ice Biomes. The only problem with this Ice Temple, is that it doesn't have a trap. All temples in Minecraft have a trap of some sort which adds a challenge to make the effort of avoiding it at all costs. The Jungle Temple having hidden dispensers filled with arrows which is hooked to a tripwire, the Desert Temple having the hidden 3x3 TNT trap hidden under a pressure plate, and the Underwater Temple having two elder guardians which add serious effects and a good challenge to obtain the loot. You could come up with something unique for a trap, but everything else seems fine right now. Endergirl is right, it needs some sort of trap. But anyways, I think this is a great idea. Of course, someone might convert it into an Ice Castle or something... which I would totally do. This would be AWESOME! Support! 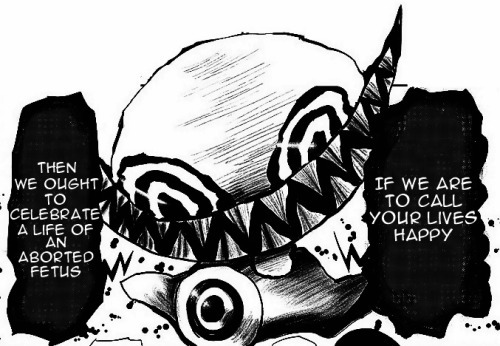 Maybe for the trap there could be a new monster inside? An ice golem or something, that attacks you as soon as you enter a certain perimeter? It would also double as a new boss, which are always cool. As long as the trap can be disabled. THE KITTY HAST BEEN RESURRECTED, AND LIVES ONCE MORE! About traps, I actually was trying to find a way to make a trap. I tried making a Ice block melt to create a waterfall that covers the inside of the temple and makes it hard to get to the loot. However, when I tried to find a way to implement something like that, the temple looked awkward. Any more suggestions to help me with traps? Location: Insert stupid joke here. How bout some kind of freezing/slowing projectile? My sig got screwed up because of a forum glitch and I'm too lazy to go find the banners to fix it. I considered using snowballs in dispensers, but that was kind of unoriginal (snowball = arrow) , so I decided to stick to ice -> water trap. In the top room there are now four large trapped chests instead of one large chest. There is less loot in these large chests, but combined have about the same loot as the original idea for one chest. One has a comparator to tell if the chest is there or has no items and the other emits a signal which turns on 4 redstone lamps. The lamps stay on permanently (Unless you break a circuit in the roof) and melt 8 blocks of ice, which all randomly melt and block update each other (to make the source block actually flow) and create a cascade of water that makes it really difficult to open the chests. The water also makes you vulnerable to skeletons, and if you're not careful you will drown. TL;DR = If you break, open, or remove items from chests in the upper room, then a waterfall may wash you back to ground level and it is really difficult to get back up. I love the design! It's like an icy Taj Mahal! I like it, but it does need a trap. Everyone always suggests a new mob to go with these sort of things, so I will suggest something different. Yes, I know you can just mine through it. But everyone does that with traps already in the game. Has anyone ever actually used the combination lock to get to the secret chest in a jungle temple? A maze would be cool (hehe, its an ice palace, get it?). Natural mob spawns would fill it up, it would be dark, and just as you about to give up hope, You find the treasure room and get a silk touch book. The whole thing shouldn't be a maze though. Just the perimeter of the building (maybe 7 blocks from the outside to the main central room) . A nice roomy interior would be nice in this sort of thing. Anyway, thats just a suggestion for your suggestion. The loot is not quite as good as it should be considering the rarity. 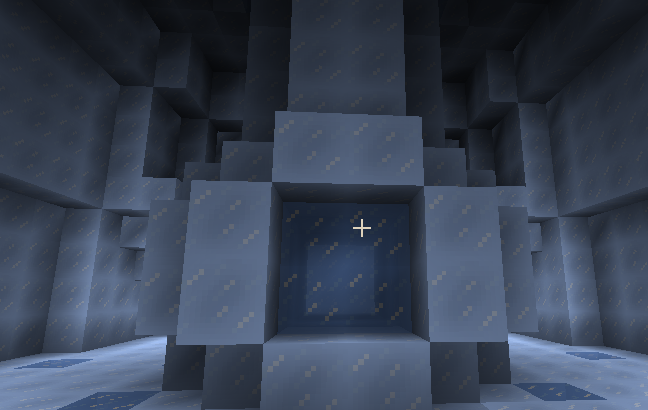 Perhaps somewhere in the center there could be a diamond block, in a room guarded by a new mob, either an ice golem like some have said or something similar. Anyways, full support. I am like idea, but design is can be better. Support. Makes sense, I can actually inhabit a place in the biome rather than trying to clear our the spikes. What about a trap which drops the player underground which is filled with water from top to bottom. The hole they fell into would then cover up and the player would need to find some means of escape before drowning. That way, you could take up space in the ground rather than around the temple itself. Keep in mind that traps need to be able to be disabled. So you would also need to find a way to make the trap sort of...visible in the player's view. Perhaps a block that stands out from the rest where the player would consider it suspicious and would need to avoid it. Nice idea! I like the design of the temple, and the loot is balanced well to. 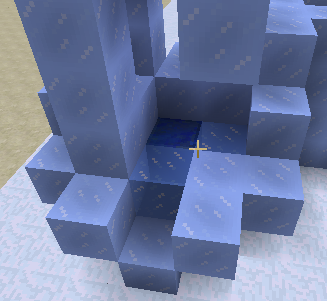 Also, I agree that the ice spikes biome is not a very desirable place to go or to spawn.